This Lomandra occurs naturally on inland drier slopes of the Great Dividing Range of Queensland and northern NSW. 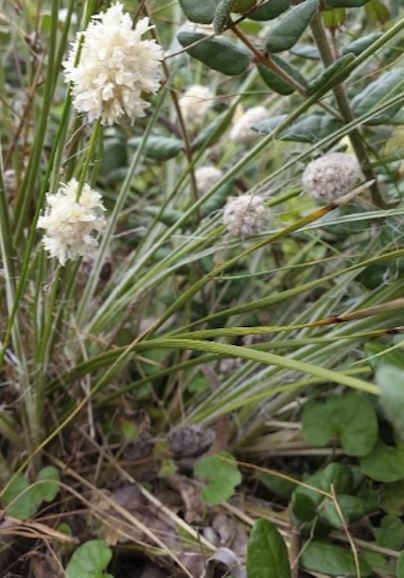 This slow growing Lomandra has 25mm balls of fluffy white flowers which exude a lovely caramel fragrance. The leaves are usually very narrow (1 to 2mm wide) with white leaf sheaths. This tough little plant is known as Woolly Mat-rush for the hairs which are prominent on the leaf margins. It is also known as Irongrass, due to the toughness of the foliage. This plant is happily growing in a south eastern NSW garden in a well drained situation in either sun or semi-shade.